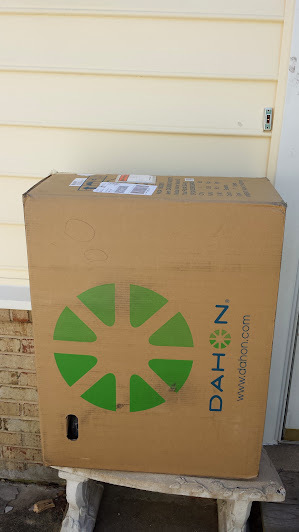 So a few weeks ago I accepted delivery of Dahon’s Mariner D7 folding bike for review! I’ve been considering adding a folder to the stable, so I was pretty stoked to get the chance to take this for a spin or 20. Because I’ve been all over the place and crazy busy, I’m wrapping the out-of-the-box and midterm reviews into one here, so get your coffee and settle back! First off though, some specs. The Mariner weighs about 26 lbs, which for the functionality (including folding) and price point (MSRP $599) is pretty decent. It comes equipped with a rear rack, integrated bungee (snaps into rack), kickstand, and SKS fenders. Sounds like a good fit for Bikecommuters.com! Components are mostly not big brand names, but appear solid. V-brakes provide some good stopping power, and the 7-speed drivetrain provides a decent range. 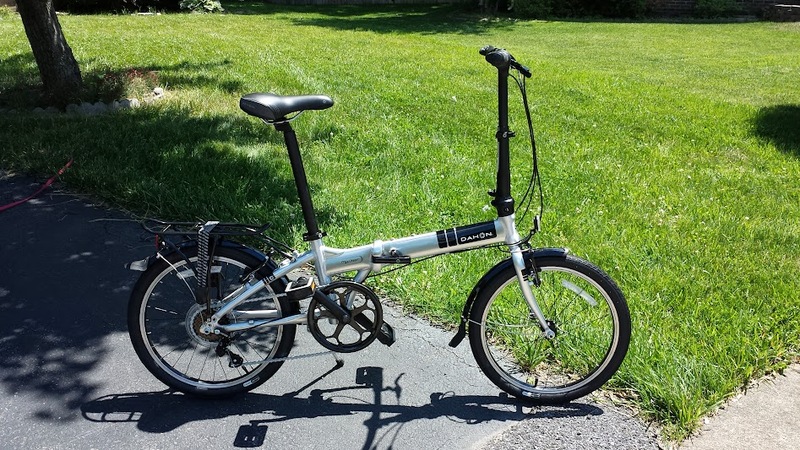 Out of the box, the Mariner was easy to set up – it came folded and without instructions, but thanks to my insane skills reasonable mechanical aptitude I figured everything out pretty quickly. Unfolding time is somewhere around 20 -30 seconds, folding time a bit longer depending on how it’s been set up. Everything is adjustable – the seatpost, stem, handlebar angle, etc. – and depending on how the handlebars have been situated they may need to be adjusted before folding (they fit in between the two wheels when folded). The seatpost always needs to come down, because the bottom portion of it also functions as support for the bike when its folded. Pedals also fold in, and there is a clip that holds the two axles together when folded; it’s not tremendously strong, just enough so the whole thing doesn’t come open unexpectedly. Once folded, the front wheel still rolls so you can move it around a bit but it’s a little awkward. Carrying it by the seat isn’t that difficult though. So how does it ride? Pretty well! It took me a few minutes to adjust to the small wheels – they’re definitely much more responsive to small steering adjustments than my usual 700c or 29er wheels. Otherwise, everything was pretty easy: the ride is comfortable, the brakes work well, the shifting works well, and there’s really not an awful lot to think about. The only caveat there is that because everything is so adjustable, it takes a bit to figure out where to set it all to be comfortable – and then to figure it out again the next time. I’d definitely recommend making some sort of marks on it for preferred setup. Because I hadn’t gotten much opportunity to ride it before heading out on a family vacation to Maine, I managed to squeeze the Mariner into the back of the car (hey, no bike rack!) and got a couple rides in while we were vacationing – including one to the grocery store, which was a (very hilly) 9 mile ride each way. I went with my brother-in-law, who was on his Surly Long Haul Trucker, and found out some of the advantages and disadvantages of the Mariner relative to a 700c commuting/touring bike. 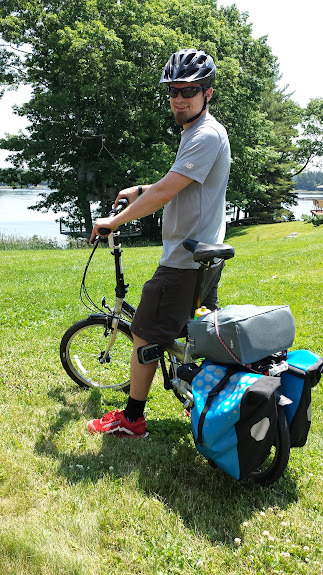 First, the gear range on the Mariner, while more than adequate for most cities (maybe an exception for San Francisco, but I assume all bikers in San Francisco have massive quads and can deal), was a little less than ideal for coastal Maine hills. I ran out of gears on both ends – so there was a little walking up some particularly steep hills, and then some coasting down the other side of those same hills when I got to spinning too fast in the top end. Standing and cranking really isn’t an option on the Mariner – the geometry makes it so it’s pretty much a seated-only bike. I also have to note that especially when loaded down with groceries in the back, the front end felt very light and twitchy and going downhill quickly was just a little hairy! So adding a top gear probably wouldn’t be very beneficial – but I thought having an 8-speed with a lower low end wouldn’t have been a bad thing. Finally, we both noticed that I was working a lot harder on some of the hills than he was on the LHT – mostly just a function of the wheel size and gear range, I think – but possibly also related to pedaling position (the Mariner is much more relaxed). In terms of carrying capacity, the Nuvo-brand rear rack has a 10kg (22 lbs) max load printed on it, which seems pretty silly to me. Probably a liability thing, but if there’s a rack, I’m going to want to put more than 22 lbs on it! I’m pretty sure what I carried was closer to 30 or 40, and I’d bet a decent amount of money it could take 50+ lbs without too much issue. 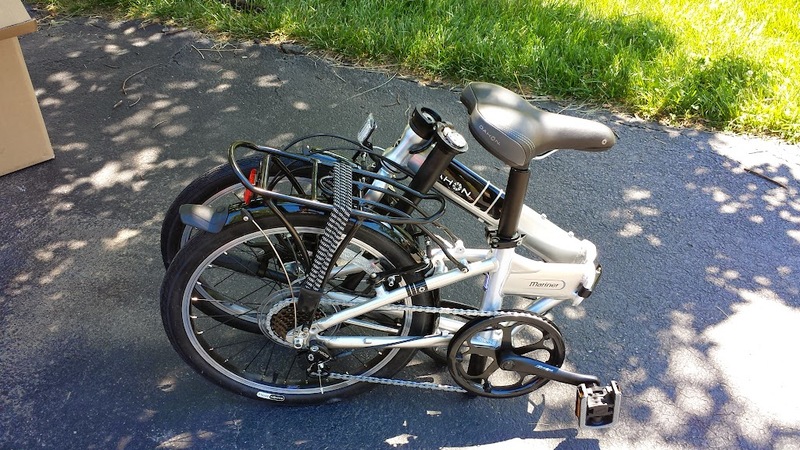 The Ortlieb panniers I used were a little bit of a tight fit – I had to shove them pretty far back to get adequate heel clearance – but they did work. I’m sure there are other panniers that would work a bit better if you were buying specifically for this bike. Other quibbles? I’d like to see some bottle cage bosses somewhere on the frame. I didn’t particularly like their choice of grips – I’ve been riding without gloves since I see this as being targeted for riders not all kitted out, and have found that when my hands get sweaty the grips get slippery – not good! Also, the drivetrain was a bit noisier than I prefer when in high or low gears (though functional). Those nits aside, I’m very much liking the Mariner. It wouldn’t be my choice for a lengthy commute, but it seems quite reasonable for shorter rides and I’ve been pretty happy with how it packs down. I’ll be putting in a final report later, and Ghost Rider will hopefully be adding in his impressions after he’s had a chance to ride it.